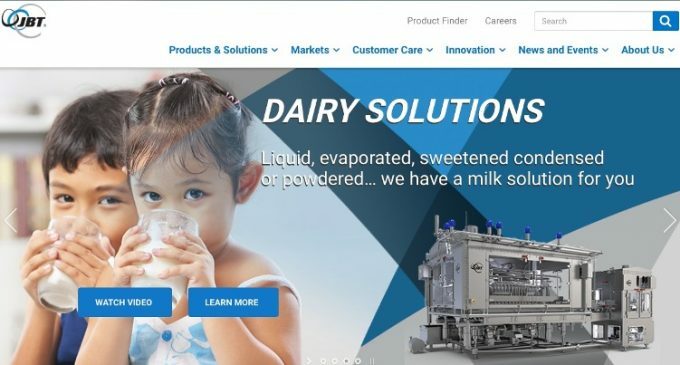 JBT Corporation, one of the world’s leading solutions providers for the food and beverage processing industries, has announced the comprehensive relaunch of its online presence, with the introduction of a redesigned flagship website. To better accommodate a range of solutions that includes not just core JBT products, but also innovations from its global businesses and subsidiaries, the website has been thoroughly redesigned to help customers find the right products for their needs with minimum effort. The site is now easily searchable for products and solutions, while those better known under subsidiary brand names – such as Avure Technologies or A&B Process Systems – are now simple to locate. Additionally, solutions have now been divided into market segments in order to make searches by specialist processors, whether that be of baby food or ready meals, that much easier. For those customers, seeking to upgrade, service or replace old machinery or parts, there is also a dedicated customer care section that will make ordering and reordering more straightforward. JBT’s dedication to research and innovation is highlighted via a dropdown menu that includes research White Papers and product videos. To complete the redesigned platform, a new section has been added for news and JBT events, which includes updates for investors, product and event news, plus customer case studies on the JBT Liquid Foods Blog.